Defenseman Adam Foote was second on the Avs in blocked shots, hits, shifts and ice time per game in Colorado's opening-round series victory over the Minnesota Wild. Please excuse Colorado Avalanche Executive Vice President and General Manager Francois Giguere while he takes a deep breath. Evidently, both Peter Forsberg and Adam Foote really do have plenty left in the tank. By signing the ever-popular Forsberg, 34, on Feb. 25, and acquiring Foote, 36, from Columbus the very next day at the trading deadline, Giguere was out to make certain his franchise had as good a chance as any other in the quest for the Stanley Cup this spring. In Colorado’s opening-round series triumph against the Minnesota Wild in six games, Forsberg finished second on the team in scoring with five points (four assists) while Foote was second on the team in blocked shots (13), hits (six), shifts (33.5) and ice time (22:59) per game. That’s precisely the type of production Giguere envisioned two months ago. He’s hoping that production will continue into the next round. Not to be forgotten was the acquisition of defenseman Ruslan Salei from Florida at the deadline. Salei notched a goal and two assists and finished with a team-high, plus-4 rating through six playoff games. The biggest boost the Avalanche received, though, in their first-round elimination of the Wild was from goalie Jose Theodore, who finished with a 1.88 goals-against average and .940 save percentage in six contests. Theodore stopped 188 of 200 shots faced, including 34 saves in a 2-1 series-clinching Game 6 triumph. Theodore certainly re-established himself as a solid No. 1 goaltender late in the regular season and in the opening round of the playoffs. He has the ability to carry the Avalanche into the conference final on his own. 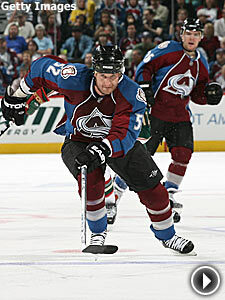 Forsberg, who joined Paul Stastny (one goal) and Milan Hejduk (two goals, two assists) on a line, had been injured for a good part of the second half of the season. But, he played extremely well and appeared physically up to the challenge during the first round. Foppa actually seems to be rounding into superstar form following foot and groin ailments late in the regular season. Stastny, who is making his first appearance in the Stanley Cup Playoffs, will only benefit from playing alongside Forsberg and Hejduk, each of whom have a wealth of playoff experience. Colorado coach Joel Quenneville had Joe Sakic, who led the team in scoring with six points, centering Andrew Brunette and Wojtek Wolski on another line and Tyler Arnason flanked by Ryan Smyth and David Jones. Wolski’s first-period goal in Game 4 proved to be the game-winner in Colorado’s 5-1 victory against the Wild to even the series, 2-2. In Game 5, , Stastny’s only tally of the playoffs, 6:25 into the third, was the difference in a 3-2 decision. Smyth was then the hero in Game 6 when he struck 12:20 into the second in a 2-1 triumph. In that sixth game -- Colorado’s first series-clinching win at home since 2004 when they eliminated Dallas in five games in the conference quarterfinals -- Sakic notched an assist on a shorthanded goal by Ben Guite in the first period to tie Bryan Trottier for ninth place on the all-time playoff scoring list with 184 points. Sakic also moved within one point of Detroit captain Steve Yzerman (185) for eighth all-time and is the 20th player in NHL history to total 100 postseason assists. His next playoff goal will tie him with Mike Bossy (85) for sixth place all-time in the postseason. The playoff uprising has been a coming-out party, of sorts, for Sakic, who averaged less than a point a game in the regular season for the first time since 2002. Sakic, who was sidelined after groin surgery, scored just 13 goals in 44 games this season. Defensively, the Avs limited the Wild to 12 goals in six games, including a total of four in three-straight triumphs to close out the series. John-Michael Liles, Scott Hannan, Kurt Sauer, Jordan Leopold, Jeff Finger, Foote and Salei were all vital defensive cogs in front of Theodore, who, thus far, has been Colorado’s MVP in the playoffs.